When I lived in Berlin, I attended the American Church of Berlin (ACB) – an English-language church with a very diverse and international congregation. To be honest, after having grown up with the strong religious tradition of the southern United States, I found this environment liberating. It was open and accepting to all and “Americans” did not make up the majority of the congregants. At the beginning of my studies, I had joined the traditional church choir. However, one aspect of the church that I adored was the gospel choir that performed at least once each month – its membership coming from the large percentage of the congregation which came from Africa. After all services there were food, coffee, and always a great deal of conversation and fellowship. I guess I loved it so much because every Sunday at the ACB felt like a celebration. In the spring and summer months if the weather was nice, I then dedicated the next part of my Sunday to going “tent shopping” at one of the many street/park markets in Berlin. As one who doesn’t particularly enjoy traditional shopping, I found myself loving the shopping experience that these markets provided: digging through boxes of used clothes, haggling the prices down (in German, no less! Hello 2 euro dresses! ), milling around for hours, listening to the musicians who stationed themselves in the middle of the market, drinking freshly squeezed orange and pomegranate juice, and finding little treasures from Germany’s history. I bought a lot of these treasures for me and for friends – old DDR (East German) medals celebrating good socialist behavior, crazy inflated currency from the Weimar Republic (I have a fifty million German mark bill in my wallet), shards of the Berlin Wall, etc. However, there was one thing that I must admit that I wanted desperately but knew would be both impractical and expensive to bring back with me to the US: a gas mask. 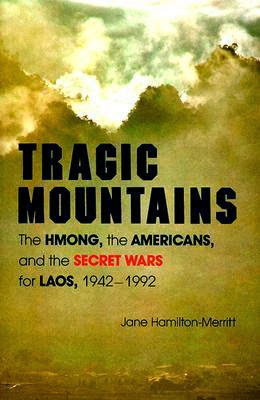 It is with this recent experience that I began to read Tragic Mountains: The Hmong, the Americans, and the Secret Wars for Laos, 1942-1992, written by Jane Hamilton-Merritt and published in 1993 by the Indiana University Press. I had purchased the book because it seemed like an interesting (and yet accurate) account of Laos, with positive reviews from former CIA director William Colby and CNN journalist Peter Arnett. It was only when I found myself engulfed in the book, that I realized that it was going to cover to so-called (and still disputed) “yellow rain:” the chemical weaponry provided by the Soviet Union and used against the Hmong people by the communist Laotian government in the early 1980s. Seeing the recent images coming out of Syria while at the same time reading these accounts and seeing photographs of Hmong children likewise victimized by chemical toxins, I found myself in a state of disconcertment. First, I feel as if it is necessary to provide some information on Laos today. As this book was written 20 years ago, I had to do some research to gain a better understanding. Firstly, it should be noted that Laos is landlocked and surrounded by Vietnam, Cambodia, Thailand, Burma, and China. Like a couple of its neighbors, it is a communist state and its political environment is dominated by a single party: Lao People’s Revolutionary Party. Laos is home to some 6.7 million people – slightly more than the population of Paraguay and Jordan. Of this 6.7 million, an estimated 33.9% survive with less than $1.25 USD per day – a level of extreme poverty – according to the UNDP. It is also important to note that Laos is home to many different diverse ethnic groups. According to the World Factbook, ethnic Lao (which mainly live in the lowlands, where the capital Vientiane is located) make up around 55%; ethnic Khmou (which live in the north) make up around 11%; ethnic Hmong (which live in the mountainous region) make up another 8%; and 100 other small ethnic groups make up 26%. You have a row of dominoes set up, you knock over the first one, and what will happen to the last one is the certainty that it will go over very quickly. So you could have a beginning of a disintegration that would have the most profound influences.